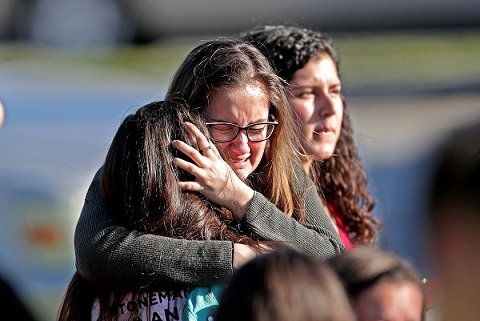 There are no words to describe the unbearable pain in the hearts of those parents who lost their children yesterday in Parkland, Florida. The country is in mourning. School is supposed to be the safest place. But repeated tragedies like these have proved just otherwise. It is impossible to understand why violence is part of the culture here in America, the world’s most powerful country. The death of 17 innocent children is hard to swallow. It happened on Valentine’s Day, a day we were supposed to show love, not a day to deal with unexpected tragedies. Although it may seem inappropriate to politicize calamities like the one yesterday, but it is also important not to avoid the broader picture. Every time we face calamities like the one yesterday, there is an uproar, only to be subsided few days later. Then it becomes business as usual. We may never be able to eradicate violence in society, but stricter gun control may certainly help. It is time to stand up and say, “ENOUGH IS ENOUGH.” The truth is that politicians are beholden to the NRA which funds their election campaigns. These folks need to be voted out of office. They only see their own selfish interests, not the protection and the wellbeing of the citizens of their constituencies.